Vermont Chess Directory. If your club is not listed or not up to date please contact us using the link under site index. If you have any chess news share this with us too. ST. JOHNSBURY -- To walk into the Unitarian Universalist Church in St. Johnsbury around 2 p.m. on Saturday, one would have seen chess master Doug Grant circling 10 different chess boards, each with a black king turned on its side. But keep one thing in mind: Doug Grant always plays white. Grant, a Littleton, N.H., resident, is certainly what one might call a prodigy, though he acknowledged that his skills did not come without a lot of practice. And at 63 years old he said it cannot be denied that age has made him a little slower. Still, that doesn't stop him from simultaneously playing 10 different opponents as a fund-raising effort for his church on Cherry Street in St. Johnsbury." BENNINGTON. CATAMOUNT ELEMENTARY SCHOOL. Scholastic. Contact: CHESS CLUB. BURLINGTON. CHRIST THE KING SCHOOL. Scholastic. Contact: CHESS CLUB C/O JANE MCKNIGHT. LYNDONVILLE. RIVERSIDE SCHOOL CC. Scholastic. DAILY. SAME . Contact: C/O BILL TOBIN. (802) 626 - 8552. PLAINFIELD. TWINFIELD UNION SCHOOL TLC. Scholastic. Contact: C/O JOHN BOLLARD. RANDOLPH. RANDOLPH CHESS CLUB. Contact: ATTN ERNEST WRIGHT. ST ALBANS. GEORGIA ELEM/MIDDLE SCH. Scholastic. WILLISTON. 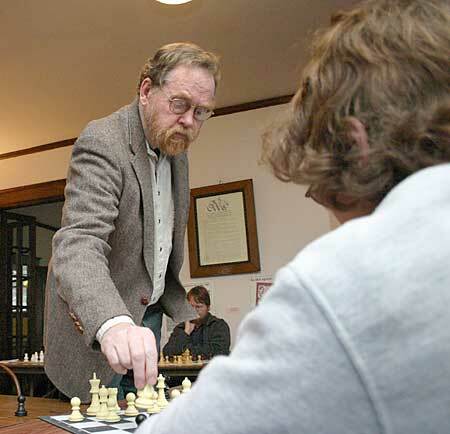 VERMONT CHESS ASSOCIATION. THUR 7PM. ATHENA CLUB , BURLINGTON,VT . Contact: ALAN M BYINGTON. (802) 879 - 0198.